I’m here to deliver this Death Star egg. What? No takers? 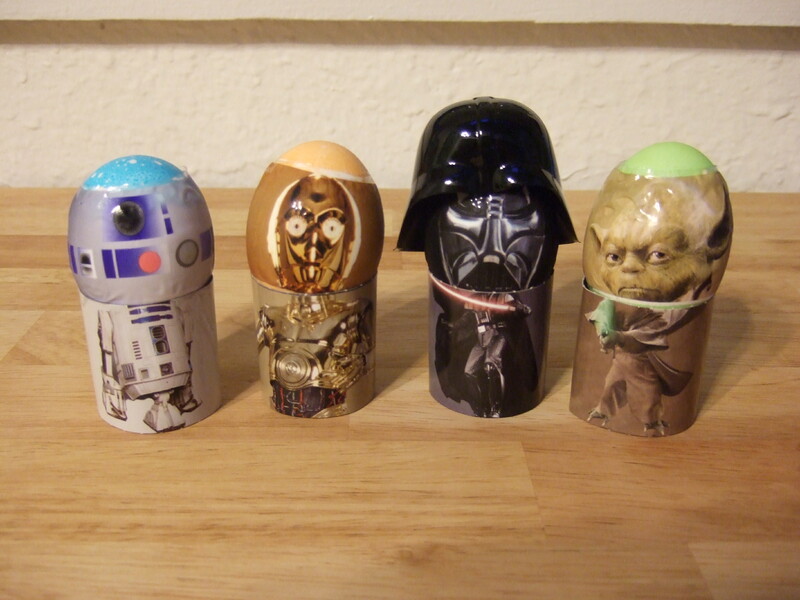 Today, as you might have noticed, was Easter across the Empire. It wasn’t for me because I’ve been doing research papers all day. However, that doesn’t mean that stormtroopers across the galaxy weren’t doing their share to spread Easter cheer.What kind of cheer? Well, Easter eggs, of course! The number 1138 appears in every film somewhere. To see the Episode I gag reel, go under the Options menu and hit 10+1 (or 11), 3, and 8. The same will get you the gag reel on E2. E.T. makes an appearance in E1 in the Senate. Two YT-1300s are visible on Naboo as the refugee transport makes its landing (E2). Achmed Best and Anthony Daniels appear out of costume as different characters in the nightclub on Coruscant in E2. One of the asteroids in the asteroid belt Jango chases Obi-Wan through is a shaak from Naboo. On disc 1 of the E3 DVD, in the Options menu, highlight the THX and select 1, 1, 3, 8 to watch Yoda do a hip hop dance. In the opening scene of Episode III, one of the pieces of shrapnel that flies off the destroyed Separatist ship is a literal kitchen sink. The Millennium Falcon can be seen departing Coruscant in E3. George Lucas and his daughter can be seen in alien getup in the opera house scene in E3. Actually, all three of Lucas’ kids appear in the films–the young Jedi Zett (in E2 and E3) is played by his son. In the special edition Mos Eisely sequence of ANH, Dash Rendar’s ship Outrider can be seen lifting off. Seriously, I can’t get any takers? Some more SW-related Easter eggs dropped off by the Stormtrooper bunny . . .
And a second batch . . . So there you have it. 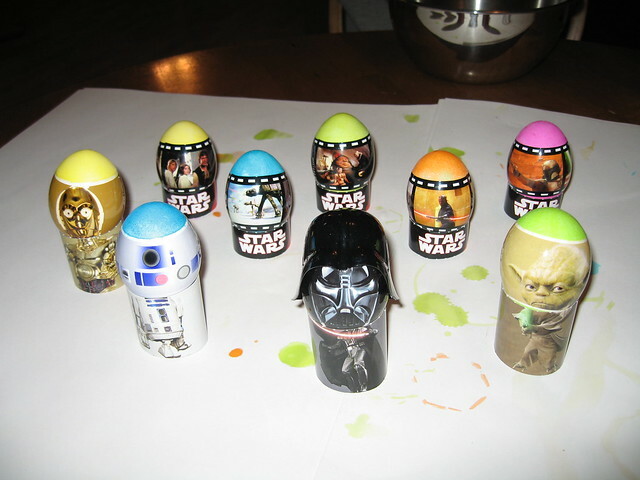 That’s how the galaxy’s celebrating Easter this year. May the Force be with you! This entry was posted on 24 April 2011 at 10:45 PM and is filed under Spotlight with tags cosplay, Easter eggs, holiday, movies, original trilogy, Phantom Menace, real world. You can follow any responses to this entry through the RSS 2.0 feed. You can leave a response, or trackback from your own site. Oohh the Darth Maul is amazing.